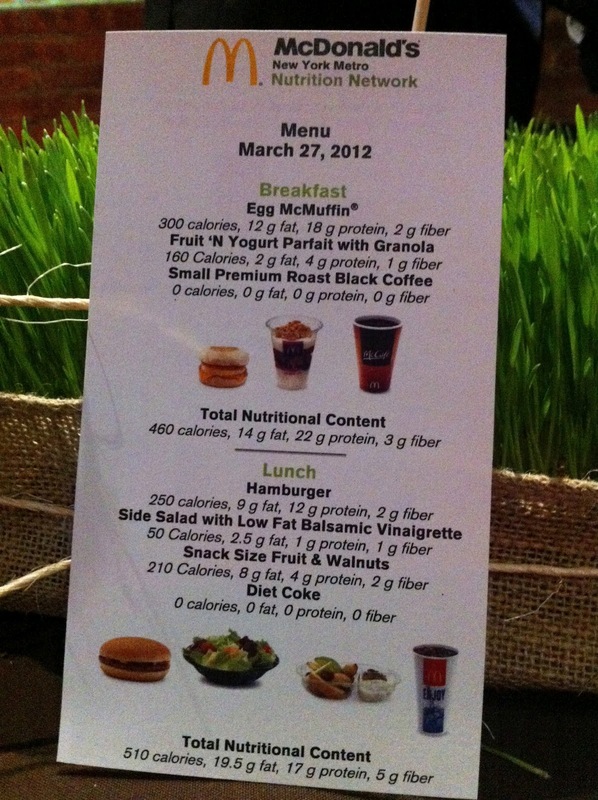 Last week I attending a press event and lunch for the McDonald's Nutrition Network Launch. It was held at the McDonald's Time Square and a few dozen bloggers were in attendance. (How do you like that? I drove to NYC AGAIN!) We all enjoyed a MickeyD's lunch (and breakfast, snack, and dinner) while hearing a little bit about McDonald's and the Nutrition Network. We also got some great ideas and tips about general nutrition. The front of our "menu". We had breakfast, lunch, snack and dinner... all in 2 hours. Yes. I went to McDonald's to hear people talk about nutrition. And do you know what? I came away feeling like I learned quite a lot. I want to say this about Tanya... she was so easy to listen to. She brought things down to an understandable level and gave examples that will stick in my head. One example: I will NEVER make skipping breakfast a part of my diet. Tanya told us how she learned that part of the diet of a sumo wrestler during training is to skip breakfast! (and she explained how it works) For me... I don't have to remember exactly why... I will always remember that skipping breakfast is a bad idea (unless I decide to be a Sumo wrestler!) Tanya's talk was just full of things that are sticking in my head. While Tanya talked to us we were served a sample breakfast, lunch, snack, and dinner. She talked about the food being served in each meal and pointed out how they were healthier choices from the menu. Let me reiterate: BREAKFAST. LUNCH. SNACK. AND. DINNER. All in a 2 hour time period. Let me point out I did not eat it all. I was tempted... but I was good! They told us not to feel like we needed to eat everything and would give us bags for anything we wanted to take to go. I'll be honest it was really great for me to get to try things I hadn't ever picked off the menu before. I am a creature of habit. I NEVER would have ventured into a couple of these items. *I had no idea how yummy a Fruit 'N Yogurt Parfait was. YUM! *An Egg McMuffin has only 300 calories compared to the average NY plain bagel with nothing on it, which has 560 calories. Hmm... I wonder which one I would rather have? *That is a lot of food. More than I would usually order. But... I've never ordered a side salad with a burger. Who'd a thought? Now I guess I will. *I brought the fruit and walnuts (with yogurt dip) home and the kids devoured it. Guess I'll be ordering that for them in the future. *Tanya purposely asked for the hamburger to be included in a meal. *I've never had a smoothie at McDonald's. It was delicious. It was the only item from the day that I couldn't help but slurp right down to the last drop. They have NO ADDED SUGAR. Just what comes from the fruit and yogurt. *I have never had a premium salad at McDonald's. I plan on eating bunches of them in the future. I would never have ordered this. Ever. But, Oh. My. Goodness. It was so good. And 3 servings of vegetables! 3! It was so delicious. And it was filling. It would absolutely be a satisfying dinner. *Tanya said she threw in the cookie for an after dinner treat because her big big big point of the day was "Everything In Moderation!" No "diet" is a good diet if it doesn't ever allow for a little treat (whatever kind of treat it is you like). Eating 1 chocolate chip cookie is not going to ruin you. A whole bag of chocolate chip cookies a day can. I have a whole new list of things I want to order at McDonald's now. Tanya Zuckerbrot had good points about nutrition and food choices. She shared her information in a way that really made sense to me. It's nice to know that when we're in a hurry and short on time not only can McDonald's be a quick convenient choice... they've made it possible to be quick while still making more nutritious choices. Fast food doesn't need to be fattening food! So, what is the McDonald's Nutrition Network? (Other than the reason I went into NYC again?) Well, in brief, it's a network "aimed at helping local community organizations in the tri-state region start grassroots nutrition programs." What that means is that owners/operators of McDonald's in the New York Metro area (including parts of NY, NJ and CT) will be helping to fund local community programs to teach families and children about proper nutrition. ("Winning organizations will receive $5000 in seed funding"!) "In addition to providing seed funding to community organizations, McDonald’s will host a series of offline MeetUps throughout the Tri-State area where registered dietitians can engage directly with families and individuals seeking nutrition information." If you work with (or know of) a non-profit charitable organization that could benefit from the McDonald's Nutrition Network program more information and an application can be found online at www.mcdnymetronutritionnetwork.com. 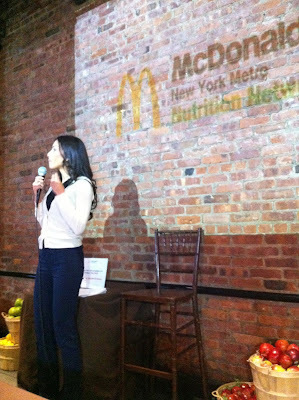 Disclosure: I was invited to the McDonald's Nutrition Network Launch by The Motherhood. 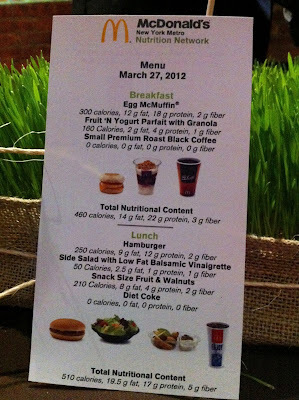 Attendees of the event were given McDonald's menu items for lunch. The Motherhood provided a stipend for parking/travel/time spent/etc. All opinions expressed in this post are my own.